Mildew, a type of fungus, thrives in damp places such as basements and bathrooms. You might also notice mildew growth around leaky plumbing or after a flood. Mildew can be detrimental to your health, especially if you have other respiratory conditions, such as asthma. Mildew also sometimes compromises the structural integrity of buildings, which can be dangerous. Mildew exposure causes respiratory symptoms in some people. 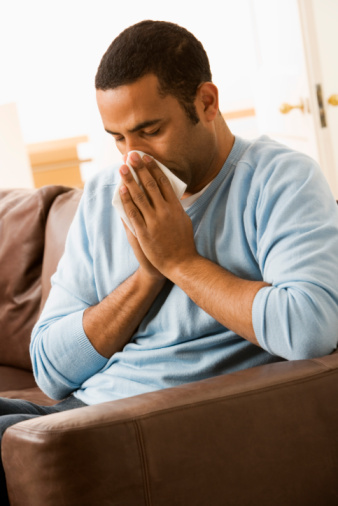 Many people experience mild respiratory symptoms, including sneezing, runny nose, itchy eyes, stuffiness and coughing after exposure to small or moderate amounts of mildew. People who have asthma may have asthma attacks or wheezing when exposed to mildew. Some people do not react to small or moderate amounts of mildew in a home or building, but you should still remove any mildew growth. People who are exposed to large amounts of mildew, such as farmers working with mildewed hay, may experience fever or shortness of breath. In addition, people who have chronic lung diseases or a compromised immune system may develop fungal infections in their lungs or opportunistic infections after exposure to mildew. Some types of mildews are capable of producing mytotoxins, although the mildews themselves are not toxic or poisonous. According to the Centers for Disease Control and Prevention, a few reports suggested that toxigenic mildews, mildews capable of producing mytotoxins, contributed to health problems such as pulmonary hemorrhage or memory loss. According to the CDC, further studies have not found a causal link between toxigenic mildews and these health problems. Mildew may also compromise the structural integrity of a building as it decomposes walls, ceiling tiles and other areas. Over time, mildew can make a building structurally unsound. Mildew can also permanently damage porous objects, such as carpet, books and upholstered furniture. Addressing mildew problems immediately helps prevent structural damage, which can be expensive to fix. Although some companies offer mildew testing or sampling, the CDC advises against mildew testing. All types of mildew should be removed from a building. While some people are especially sensitive to certain types of mold, these sensitivities vary. In addition, mildew sampling tests are often expensive, and the CDC has not established guidelines for interpreting sampling results.